The evidence that people have hope for a more peaceful and compassionate world can pop up at some unexpected moments. Our local independent bookstore, Bank Square Books, is offering an unusual window display as we make our way through the holidays. 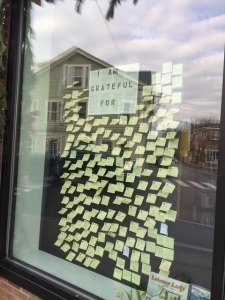 Rather than using precious window display space to tempt the passerby to buy beautiful books, they have created a tableau of hundreds of small, yellow post-it notes – each describing something the contributor is grateful for. From across the street, it looks like a constellation of tiny square stars. Up close, it is a delightful collage of how people pay attention to goodness surrounding us. Many people are struggling to survive tragedies, abuse, precarious life situations, and how to understand what actually is true. What action can we participate in that will keep our sense of communal hope alive when one tragedy is followed by another and another? I felt a gust of hope when I passed the window at the bookstore with its unexpected display of hope in the window. What a wonderful present to begin a new year! What a feast of words for the heart! Thank you! Ruth W. Crocker is the author of Those Who Remain: Remembrance and Reunion After War and People of Yellowstone. She lives and writes in Mystic, Connecticut.